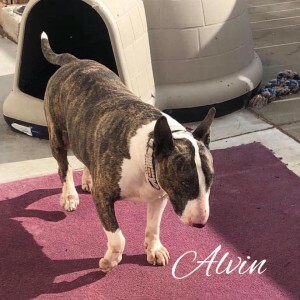 Alvin – San Francisco, CA | Bull Terrier Rescue, Inc.
Alvin is a hunky 68lbs of burning love! He entered our program when his older owner could no longer care for him due to health issues. He has been great with all dogs so far and enjoys his walks as well as naps on the sofa (he loves to snuggle and watch TV with you). Alvin is 7 years old (born 2/5/12). He is crate, house and 95% leash trained (he has his stubborn moments where you just give his leash a gentle tug and he’ll move on). If your information is not yet on file, please complete online application (http\://www.bullterrierrescue.org/?page_id=572). Please contact Suz at suz@bullyhaven.org or 415-672-7391 if you have any questions about this sweet guy. This entry was posted in Available Dogs, Available Males, Available Seniors by Susi Ming. Bookmark the permalink.